A compound miter saw is probably the most accurate and easy-to-use woodworking tool for making crosscuts on wood. Essentially, this woodworking machine is a large circular saw mounted on the end of a balanced lever. After aligning the miter and bevel gauges to the proper angles, the blade of the compound miter saw is plunged into the wood, allowing you to make a square, angled or beveled cuts on the ends of boards. In many cases, a saw can be beveled up to 45-degrees and angled as much as 60-degrees in either direction, allowing for precise compound angles to be cut accurately. The base of a compound miter saw can be rotated so that the saw blade is angled up to 45-degrees either to the left or right of center. A quality compound miter saw should have a clearly marked miter gauge (which can be easily tweaked when necessary), and hard stops at 0, 15, 22.5, 30 and 45-degrees in both directions. The woodworker should also be able to lock the saw to any specific miter angle they need up to the maximum angle in either direction for custom angle cuts. The "compound" part of the name comes from the saw's ability to tilt the saw in addition to rotating the base of the saw to set the miter angle. Some saws will only bevel in one direction where others will bevel up to 45-degrees either left or right. The ability to bevel in either direction is especially helpful when the woodworker needs to cut two angles on the same cut. Installing crown molding, for instance, becomes a much simpler procedure when two precise angles can be cut at the same time. Having the ability to tilt either direction allows for greater versatility in making the complex cuts. Compound Miter Saws typically come in 8", 10" or 12" blade models. Most users find the 10" model perfectly adequate, as the 8" is just not large enough to cut angles on a 6" piece of stock on a 45-degree miter, nor tall enough to accommodate the stock on edge. Conversely, a 12" model may be a bit exorbitant price-wise. However, if you can afford a quality 12" model, you'll definitely appreciate the larger blade size. Some miter saws have an additional slide feature where, after sinking the saw into the material, the blade may be pushed or pulled through the wood, allowing the woodworker to cut larger pieces of stock than would be otherwise possible. The additional motion gives this type of saw a radial-arm feel. While this is a very handy feature, it can add considerably to the price of the saw. Some companies sell a laser light that can be installed onto your miter saw that will show exactly where the saw will cut. This takes any guess work out of cutting compound angles. Simply mark the spot for the cut, set the miter and bevel, place the stock firmly against the fence, line up the mark with the laser line and make the cut. It couldn't be any easier. 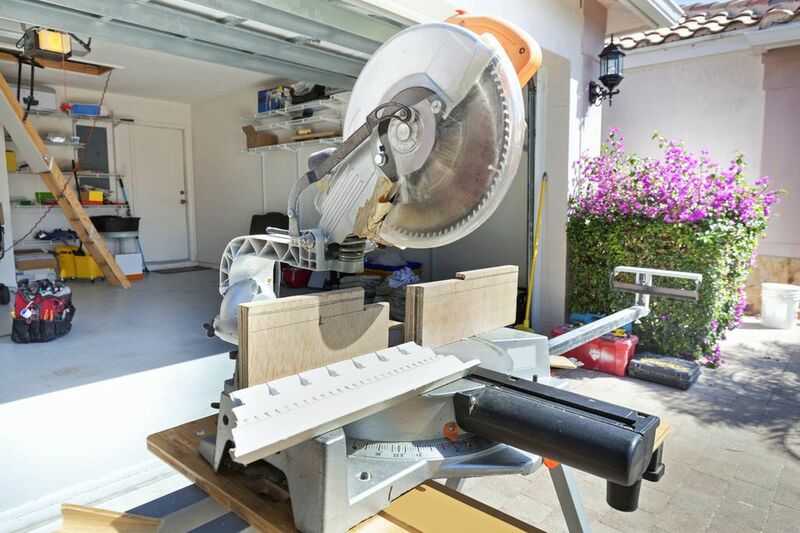 Research compound miter saw reviews on Consumer Search.